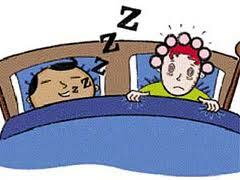 It is a medical fact that poor sleep interferes with weight loss and can even cause gains. According to the doctors at the NYU Langone Medical center in NYC, studies have shown that people who get enough sleep BUT have to do it in the daytime because they do shift work, are much more likely to be obese after years on their jobs. Remember that the next time you see a plump police officer working the graveyard shift or a chubby nurse in the ER when you have a medical emergency in the wee hours of the morning. These workers are hurting their own health to protect ours. I make sure the bedroom is dark, cool and comfortable for sleep. Even if I do not always get a full 7 to 8.5 hours I have been able to claim restful and sound sleep during the hours of slumber I do get. This changed a few weeks ago and I am finding it is starting to really wear on me. My husband, who has always snored but never enough to wake the dead is suddenly snoring louder. The snoring wakes me up during the night and I find myself either poking him or screaming at him to stop making that noise while I am half a sleep. He has a doctor's appointment and yes, he will have a sleep study done and I am perfectly fine with the white noise of a breathing device if it means he and I can both sleep better. Until then, I am irritable and finding myself falling asleep at my desk before noon. I also find myself unable to pop out of bed at 6 AM. I am normally a happy person in the morning. No so much lately. I keep trying to go back to sleep. I know this abrupt change in sleep pattern is already affecting how I exercise and how hungry I feel in the afternoon. I do not mind feeling the hunger (it is better than feeling whacked out on food) but I also feel like my hands are swollen and I know my calves are swollen this week. I wonder what part of that is caused by disrupted sleep? How does your sleep environment affect your body and your pounds? I CRAAAAAAAAAAAAAAAAAVE the sugars only when Im not sleeping well or enough. It definitely affects me. I like it dark and cool as well. My kids still wake us up sometimes with bad dreams, etc. and that affects me the next day. I had to get a long way into my process before I discovered I was self sabotaging with (lack of good) sleep. I thought I was someone who could make it on just a few hours sleep. I think it is one of those cases where since I didn't drop dead, I thought it was okay. I see that viewpoint frequently in weight loss blog land. If we don't have an immediate, very visual, negative consequence, then we think an action is 'okay'. Do you have an extra bed until he gets his snoring straightened out? My husband twitches. We had to get two extra long twin beds and put them about 8" apart. I know that would not help with snoring, but I am saying, we had to make a change for me to sleep. My lack of sleep is a big issue for me but I've always had problems sleeping at night. If only I could sleep during the morning and afternoon lol. How lucky of you to have a husband willing to get help for his snoring. Mine sounds like the freakin' Kraken when he sleeps and refuses to go to the doc. He just BARELY is willing to wear a breathright... which does help. The sleep interruption and deprivation kills my diet, motivation, mood... I need sleep to function on all but the basest level. I don't have problems sleeping at night. I try to sleep early every night, because when I stay awake for a long time at night, I tend to crave for sugary food. You are correct: sleep problems can cause weight gain. But, of course, it is not the lack of sleep per see that causes it, but that people then are more likely to eat more. My theory is that the stress from the lack of sleep is sometimes mistaken for hunger or that eating is used as a substituting self-gratification for the sleep that is missing. MIZFit - Congrats on your win for Best Weight Loss blog on Cranky Fitness. Vickie - I wouldn't want to change rooms. I will try earplugs first - or not go to bed until I am exhausted. Twitching would drive me into another bed, which is funny because I twitched for years and he never said a word or left the bed ever. Munchie - you got him to allow a camera up his rear - tell him the sleep study is more fun and he can eat this time. Honeybee - I never drive for excessive hours on trips anymore for the same reason. It leads me to crave sugars and the lack of sleep lowers my resistance. All lead to dangerous behavior on and off the road. Evilcyber - I concur with your theory. I also believe that lack of sleep plays with our hormones and that is why we do not release our weight the same when we lack sleep.